SAL DeTRAGLIA'S VIRTUAL TAPAS BAR: PAELLA FOR DUMMIES: A PICTORIAL TUTORIAL. Some topics simply don't need words. 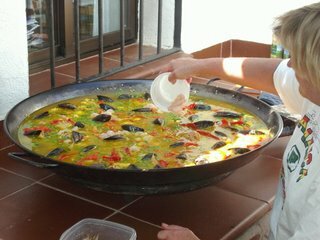 I've never tasted Paella ... the wordless procedure intrigued me. Fantastic. 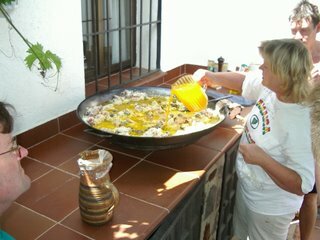 I *have* tasted paella before and those pictures are making me want some RIGHT NOW. Will have to settle for bratwurst. Again. I want some right now too!! Will you part with the recipe? Please? It's paella or bust time. Yoda! now that looks incredible. I think I'll be craving it soon too. That's one heck of a pan! I don't think it would even fit in my kitchen! LOL. Sorry, you lost me on the paella. I have tried to try it before, but couldn't bring myself to it. You see, I hate, hate, HATE sea food of all kinds. If it has fins, flippers or claws...KEEP IT. If it swam in the ocean, lake, pond, pool or puddle...KEEP IT. How did a sea food hating girl end up in a country surrounded by water? The funny thing is that my brother LOVES sea food and yet he is stuck in Indiana. The only water near him is lake Michigan, and you and I BOTH know better than to eat the stuff swimming around in there! hehehehe! Just wanted to wish you very happy 4th of July. Hope you find a little way to celebrate! I can certain understand how living to close to Lake Michigan might turn you off to seafood. You know...with those two-headed fish and all. But I'm pretty sure that the Italians have a way with the stuff--even to the extent that you might like it. Besides...it's all seafood, but a sole couldn't be more different from a makeral...which couldn't be more different from a calamari...which couldn't be more different from a prawn...which couldn't be more different from a scallop...which couldn't be more different from a barnacle. So, c'mon...don't be a chicken who eats nothing but chicken. And a happy fourth to you, as well. hi, i'm new to your blog and stumbled across it via traveller one's blog. i really would like to pick your brain on bcoming an expat in spain. i'm an american and am eyeing spain and portugal as potential homes. (i'm REALLY interested in the potential for employment. i'm a writer/copy editor). That's the beauty of it...you can use anything you want(Tho I have never seen beef used). 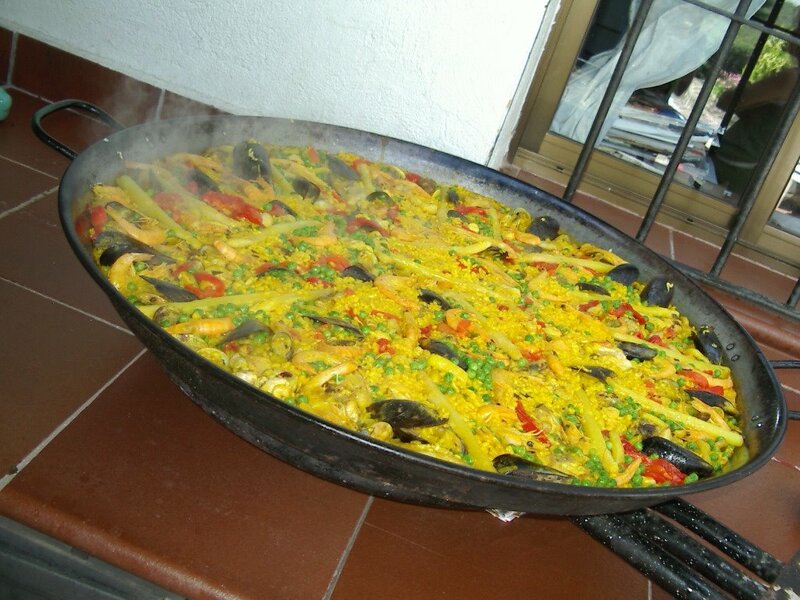 I've been told that paella originated in Valencia, and there, paella without chicken and rabbit should be called something else. 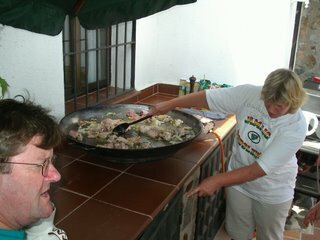 Whereas my friends in Asturias have never eaten a paella without seafood. The obvious regional differences in this Spanish comfort food not only include the source of protein, but when to add the water or the rice, among other ingredients. Let's not even get into the specific differences between Abuela A y Abuela B's paellas. I just mastered the tortilla, and it may just take a few months before I venture on to Planet Paella, but I never turn down a serving of my favorite siesta-inducing lunch. FRIDAY NIGHT VIDEOS: ELVIS DOES ZEPPELIN!